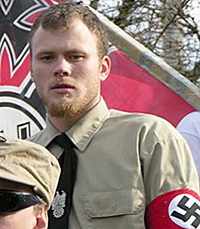 Justin Boyer, 24, the former boy wonder and Washington State Unit commander of the neo-Nazi National Socialist Movement (NSM), has announced that he’s forming a new militia-style paramilitary group called the United Globalist Movement. It’s apparently not the kind of militia group most of us remember from the 1990s. Boyer, identifying himself as the “Commanding General of the Land Forces,” wrote in his April 23 post that “[p]arty members will have ranks and uniforms. … Party members will be trained like a political and Military machine in all walks of life.” Although Boyer claimed his new organization is a “peaceful movement,” he added that “I am a believer in training for everything and that includes war.” “Most of our members have Military back rounds [sic] and other things I cant [sic] go into right now,” Boyer concluded. Boyer, who told a reporter earlier this year that he first read Adolf Hitler’s Mein Kampf when he was 10 years old, claimed to have renounced racism earlier this year after listening to Barack Obama’s Election Night victory speech. “It was like something just went off in my mind. It was like, ‘Man, this guy’s right, you know.’ Time for a change,” Boyer was quoted in February as saying in the Wilmington News Journal. (By that time, Boyer had quit the NSM to become the Ohio state leader of another neo-Nazi group, the American National Socialist Workers Party, a post he also is said to have resigned). The United Globalist Movement’s manifesto is diametrically opposed to that of virtually all other militias. It calls for the formation of a one-world government that would stamp out poverty, racism, religious fanaticism and environmental degradation.